Garden-style Sloppy Joes - Get the Good Stuff! Everybody loves sloppy joes! This one's been dragged through the garden, thick with onions, celery, carrots, and mushrooms, to make a tasty and healthier version. Don't be dismayed by the huge pile of vegetables you'll chop - it goes quickly, and the veggies cook down to blend with the ground beef in a perfectly splendid balance. 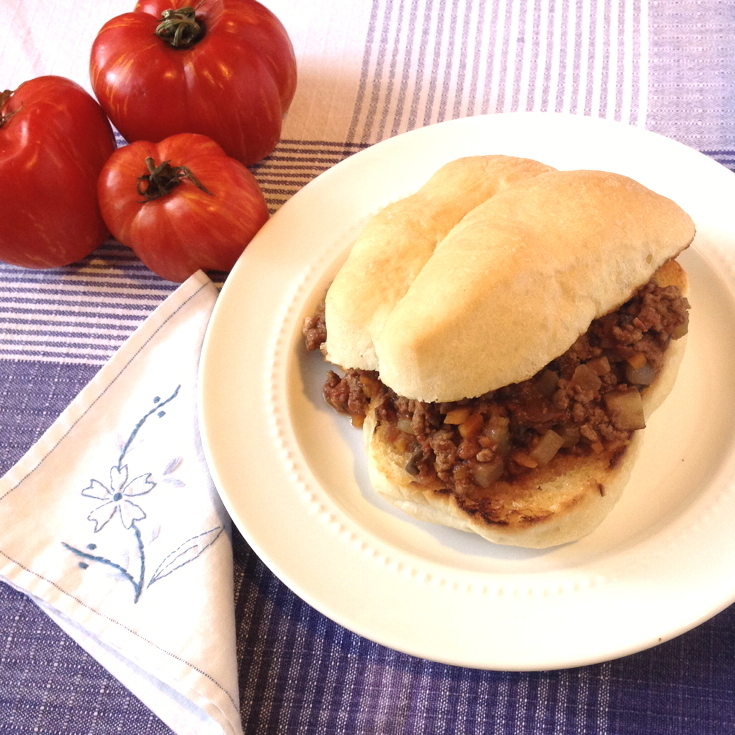 I like my sloppy joes to be chunky and flavorful – no thin wimpy sandwiches, please! I also like to stuff them with vegetables, turning them into one-dish wonders. This is a great dish to make in quantity – even better, make the sauce a day or two ahead of time, then heat it in a crockpot for a fuss-free meal on a busy day. Finely chop the onions. Cut celery lengthwise and then chop small. Peel carrots, slice into long planks, then cut into very small chunks. Cut the mushrooms into larger chunks about the size of a garden pea. Mince the garlic cloves. In a large skillet or wide saucepan, brown the beef over medium heat, breaking it up into crumbles as you cook it. Once it’s browned, drain the beef and set aside, discarding the rendered fat. Raise the heat to medium high, and warm the teaspoon of olive oil in the same pan. Add onions, celery, and carrots. Cook gently about 5 minutes, until the onions are translucent and the carrots begin to soften. Add the mushrooms and cook another 5 minutes or so, until the mushrooms are soft and tender. Add the garlic and stir a minute, until the fragrance blooms. Return the ground beef to the pan. Stir in tomato paste and tomato sauce, ketchup if using, 1 tablespoon vinegar, Worcestershire sauce, salt, and pepper. Reduce heat to low, cover, and simmer for 15 minutes. Taste the sauce. Add more vinegar, salt, or a bit of sugar, if you think it’s needed. If the sauce is a bit too thin, raise the heat to medium and simmer, uncovered, 5-10 minutes, until the thickness you prefer is reached. Serve on hamburger buns with substance – this is a thick chunky sauce, so you’ll need a bun that can stand up to it. Be prepared for a delicious, tasty mess – there’s no neat way to eat a sloppy joe. Make this ahead! The sauce for garden-style sloppy joes will keep, refrigerated, for up to a week, or frozen, up to 3 months. I like to make a double helping, so I have some to eat now and some to freeze for later. Recipe source: adapted from “Favorite Recipes from First United Methodist Church of Stillwater, Minnesota”, via The Kitchn. If you have an extra copy of that church cookbook, please send it to me! I love community cookbooks.